Look closely—that chainlink fence is made from a bridal veil; those waves are paper towels; the pile of rocks is actually crushed eggshell. 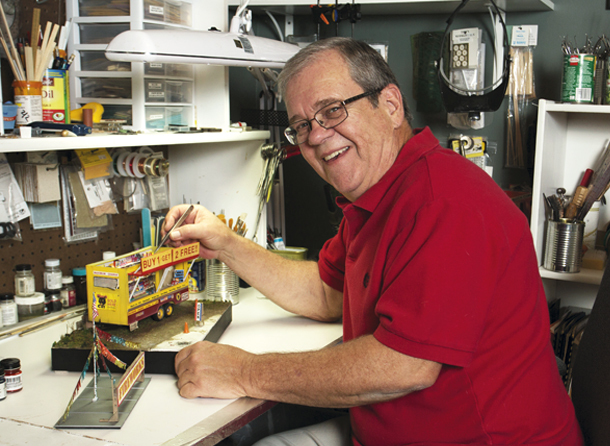 Ken Hamilton has a knack for using everyday objects to construct his miniature models. For him, the art form began as a childhood hobby. He went on to study fine art at the University of Pennsylvania and the Pennsylvania Academy of Fine Arts, though he decided to go the practical route with a career in environmental remediation. His work was exhibited at a few galleries in Philadelphia, but it wasn’t until after retiring in 2013 that he began creating full time; he moved to Charleston the following year. Now, the prolific retiree is a resident artist at the Lowcountry Artists Gallery and often recreates ordinary buildings that one may not initially classify as beautiful. According to Hamilton, this is just the beginning. Early start: I’ve been building models since I was a kid. I have a photo of me at eight years old sitting at the family table with a paintbrush in hand, building a model of the Queen Mary, which was a very popular kit at the time. Mini materials: I try to match what things are made of in real life as much as possible. I cut roof shingles from sandpaper for the Lowcountry Seafood building, and I wove carpet threads together to create sweetgrass baskets for the sweetgrass shack. Sometimes I have to use other materials. To make waves for the Hunting Island piece, I soaked paper towels in plaster, added color, and created breakers with poly fiber stuffing from pillows. The details: The fun part starts when the basic structure is done, and it takes on a life of its own. As I add details, I create stories in my head, thinking about what could have happened there. For example, the upstairs resident of my Charleston single is a gardener, so there are tons of potted plants. I like implying a sense of the past, present, and even future in the details. Zooming in: I create pieces that are a slice of a larger scene, like the Shop & Save replica, which just shows a section of the storefront. It suggests that there’s more going on beyond what you see. Finding inspiration: I build what catches my eye. For the sweetgrass shack, I was on my way to dinner and running early, so I was driving up and down Highway 17—then I saw it. Art you can touch: Occasionally I have to repair things because people come around poking at them. Some people have asked me to enclose my pieces in plexiglass, but I hate to do that. It acts as a barrier to someone experiencing the piece. I’d rather repair it. Other activities: When I’m not building, I write a tips and tech column for a magazine called Scale Auto—I’m like the “Dear Abby” for model car builders. To check out our video giving a closer look into Hamilton's fascinating process, click here.